March 16, 2011: Mark your calendar. On March 19th, a full Moon of rare size and beauty will rise in the east at sunset. It's a super "perigee moon"--the biggest in almost 20 years.
. Nearby perigee moons are about 14% bigger and 30% brighter than lesser moons that occur on the apogee side of the Moon's orbit. "The full Moon of March 19th occurs less than one hour away from perigee--a near-perfect coincidence1 that happens only 18 years or so," adds Chester. 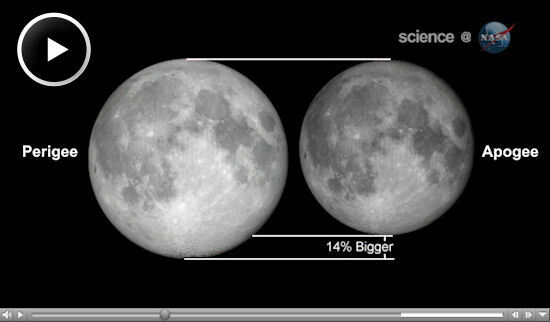 A perigee full Moon brings with it extra-high "perigean tides," but this is nothing to worry about, according to NOAA. In most places, lunar gravity at perigee pulls tide waters only a few centimeters (an inch or so) higher than usual. Local geography can amplify the effect to about 15 centimeters (six inches)--not exactly a great flood. 1Footnote: Less-perfect perigee moons occur more often. In 2008, for instance, there was a full Moon four hours from perigee. 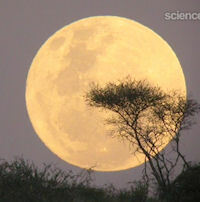 Many observers thought that one looked great, so the one-hour perigee moon of 2011 should be a real crowd pleaser.